Artist Studio Tour Prescott in full swing! 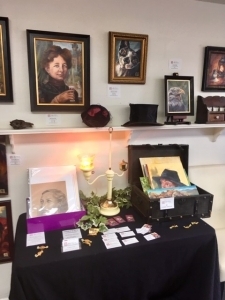 Come by this weekend and join me at the Mountain Artist Guild, 228 N Alarcon, downstairs, for the yearly Artist Studio Tour! I have giveaways, painting demos, fine art and snacks, brochures and tips to see the other artists of the tour! There’s 14 arists in and about this building, and a total of 100 around town! 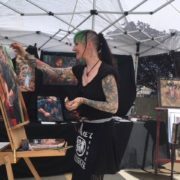 Come by for a chat and see my paintings live and in color ;) Daily 10 am to 4pm! Don’t forget to enter the free giveaway – you can do that also here, online – until Sunday 4 PM! Drawing is on Tuesday! https://www.anstaylor.com/wp-content/uploads/2018/10/ast3.jpg 480 640 Ans Taylor /wp-content/uploads/2017/10/ans-taylor.jpg Ans Taylor2018-10-06 14:34:472019-04-16 20:53:29Artist Studio Tour Prescott in full swing! You can win this Cactus Queen print! Join the Prescott Artist Studio Tour online by taking part in the raffle! 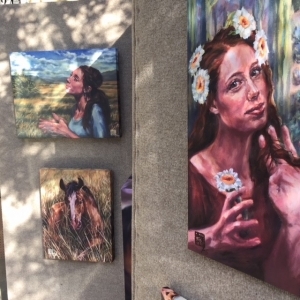 If we are connected on social media you might have noticed that I have been preparing for Prescott’s biggest yearly art event: the Artist Studio Tour 2018. There will be lots of new art pieces, live painting demos, snacks, music and sangria – and a raffle for a brand new Xposer print! And this is where you can join in the fun, even if you live in another state: just join my mailing list (enter your email address in the popup here: Ans Print Shop) for your chance to win the 16×20 Cactus Queen art print! Deadline for the raffle is October 7, 4pm. The winner be determined by random.org on Tuesday, October 9th. (If you’d like to give a friend of yours a chance to enter the raffle and get an extra entry yourself tell them to join my mailing list at shop.anstaylor.com to take part. There’s a pop up asking for the email – every entry between now and the deadline is in). An Xposer print is a new and contemporary way to display your wall art: It’s a satin finished photo print (see photo on top) that comes with a light aluminum structure on the back (see photo below). Its easy to click the print into the mount – the result looks like a picture floating about an inch off the wall. Pretty neat! https://www.anstaylor.com/wp-content/uploads/2018/09/ansxposerprint.jpg 680 680 Ans Taylor /wp-content/uploads/2017/10/ans-taylor.jpg Ans Taylor2018-09-26 19:25:252019-04-16 20:50:39You can win this Cactus Queen print! 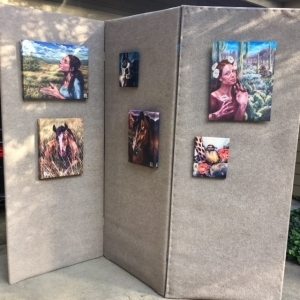 Need an instant Art Panel Wall? 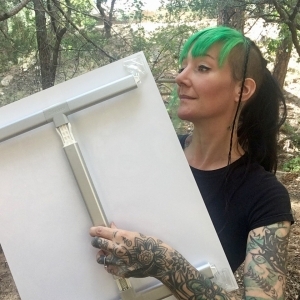 I’ve been busy preparing for the Artist Studio Tour Prescott coming up in October, and I ran across this ingenious recipe that I wanted to share with you. This is for the artists among you, and all the DIY fans. Wall space is notoriously tight at many shows – and in the case of my upcoming event, it comes with extra assets not conductive to hanging pictures (shelves, clocks, mirrors). 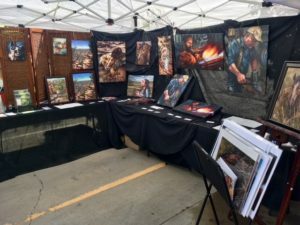 The other item being somewhat tight before exhibitions is usually the artist’s budget, as all means are being poured into extra art supplies, frames, marketing, prints, and the like. So I roamed the internet and found a solution from this creative lady . 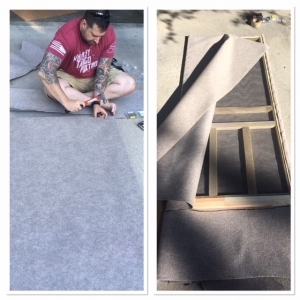 With the help of my (far more gifted at anything to do with handiwork) husband I collected 3 light screen doors, 3 outdoor carpets, 4 door hinges and 6 rubber bumpers, and went to work to create Pro Panels to display my canvas art prints! It took about 3 hours total, and it’s definitely a two-man job. But the result looks quite respectable, what do you think? I hung up several canvas prints and one Xposer print, to test the finished panel, and I was pretty happy. By the way, do you see the print with the delightful lady and the cactus flower hair-do in the Phoenix desert environment (Cactus Queen2, to the right) ? That’s the brand new 16×20 Xposer print which will be the raffle price at the Artist Studio Tour (October 5-7, Mountain Artist Guild, downstairs). More about that soon – you can also enter the free giveaway online! Write or comment if you have questions! https://www.anstaylor.com/wp-content/uploads/2018/09/panel3.jpg 640 640 Ans Taylor /wp-content/uploads/2017/10/ans-taylor.jpg Ans Taylor2018-09-17 19:41:242019-04-16 20:53:45Need an instant Art Panel Wall? the online magazine Voyage Phoenix did an interview with me. Have a look and tell me what you think! 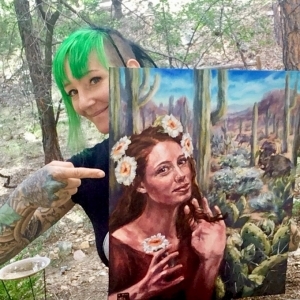 They had formerly come across the Cactus Queen painting on my social media, and shared it on their site. I’m very pleased and humbled they took the interest to follow up with an interview afterwards. It’s great to see the way this magazine is supporting local creatives! 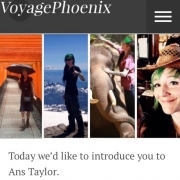 https://www.anstaylor.com/wp-content/uploads/2018/09/voyagephoenix.jpg 640 640 Ans Taylor /wp-content/uploads/2017/10/ans-taylor.jpg Ans Taylor2018-09-05 14:49:432019-04-16 20:55:15Interview on Voyage Phoenix! Friends! I’ll be traveling Germany and Austria for the next couple weeks to visit my family and friends 💚 Check in with me on Instagram or Facebook if you enjoy pictures of crooked old houses, vineyards, alpine mountains and the occasional sketch on the road. I’ll share a bunch in my IG stories (aka just click my profile pic to see what’s new). Also, no orders from my shop can be processed until July 10. Please take that into account if you plan to order anything. Thank you for your patience! 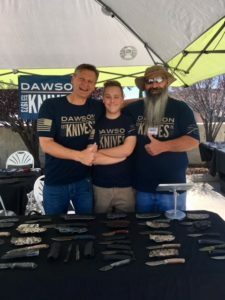 Oil paint, blades and sword cutting demos: my setup at the Dawson Knives Open House 2018! 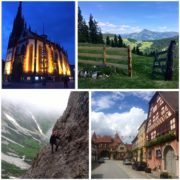 I wanted to share some impressions with you. Thank you again to everyone that stopped by to watch and talk and give feedback about my art, or even take it home! It was a pleasure! 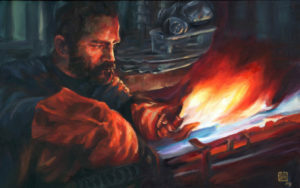 The new sword/ knife themed oil paintings will be available on my website soon. And there’s plans for new Arizona art next year! 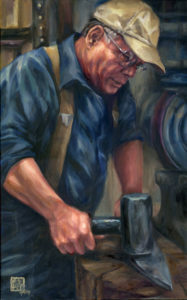 New local artist depicting 3rd generation Prescott Valley knife craftsmen, celebrating American workmanship in oil. 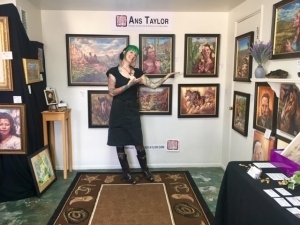 For their yearly Open House Show the family owned knife artisans are now objects of visual art themselves: Painter Ans Taylor has been watching their work process and pictured it in oil on canvas. Ans Taylor came to Prescott in 2017, taking the long route from Germany with her US military husband Tim. 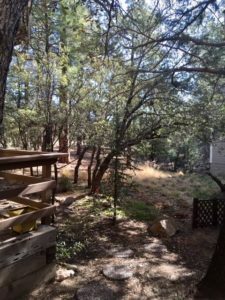 The Army took them from Europe to the US, then to Japan, and finally to Arizona, where they chose their forever home in Prescott. 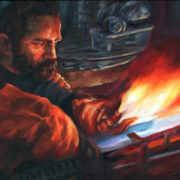 Tim Taylor followed his dream and pursued a second career with the renowned custom blade crafters ‘Dawson Knives’. The family business around founder and Vietnam vet Barry Dawson has been operating out of their shop in Prescott Valley for the third generation. Their thoughtfully designed and carefully hand made products are pieces of art in themselves. Getting acquainted with the work ethics and craftsmanship of these local artisans, Ans felt inspired to paint some scenes of their ‘daily grind’ in oil on canvas. 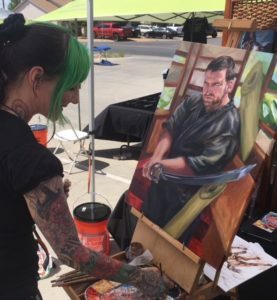 She will be displaying her art at the yearly Open House Event of Dawson knives on Saturday May 19, complementing the program of sword cutting demonstrations and shop tours with a live oil painting demo. 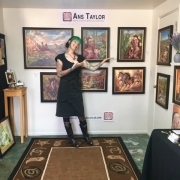 Ans is compelled by the diverse people, wildlife and landscapes of Arizona, and wants to share her fascination with her paintings. Drinking beer is easy. Trashing your hotel room is easy. But being a Christian, that’s a tough call. That’s real rebellion. When tolerance is not linked to a widely agreed-upon ethical structure – we tolerate those who disagree with that structure – but is untethered to any structure, it becomes the supreme good, and soon becomes astonishingly intolerant of those who disagree with this new tolerance. 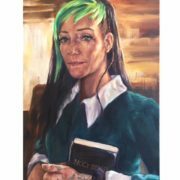 In ‘Countercultural’ I wanted to depict an honest spirituality and the personal dialogue with a God that is no longer acceptable in our mainstream culture. In an age without objective truths or absolute authorities, the concept of an universal good or evil fades into ‘personal preferences’. Everything goes – except saying that not everything goes. Having become a Christian quite unexpectedly at age 40 it seemed no one would have been more surprised than me. But soon I discovered my search for truth in an ‘organized and outdated religion’ instead of choosing any hip fareastern-western ‘bake your own God’ mix reaped harsh criticism from many secular friends. Moreover, my distasteful new habit of not putting God in a convenient corner to be dusted off once a week, earned skepticism even from some Christian acquaintances. Weren’t us artists traditionally the ones provoking thought and discussion? So here’s a new ‘rebellion’: I painted a real Christian – not one paying lip service or using the name for political reasons – in all her beauty caused by grace and peace coming from a deep well. Happy Easter! Are you celebrating the best news of the year? 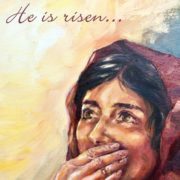 Share your joy with your loved ones and send this free ‘He is risen’ E-card via email. Just follow the link below, fill in your email (so they know where its coming from) and the email of the recipient, add an optional message, and off you go! They will receive the card with the painting and your message in their inbox immediately (in case you forgot to mail one…). I designed this Easter card with my in-laws in mind. They are wonderful people, and I get to see them far too rarely. Mom mentioned there’s hardly motives without (depending on the season) Easter bunnies, Santa, elves and other comic characters. While as a lover of books and stories as well as all kinds of illustrations I still treasure funny characters on post cards, as a believer I can also understand the urgency and wish for cards that depict the actual reason for the celebration in our western culture. I hope you enjoy the card. I’m considering a Giveaway for the original painting (oil on panel, 11×14), what do you think? Let me know. Studio tools for the emerging artist 1: Get your painting space! I want to start with a little series about studio tools I value. This gives me a chance to introduce my happy little art working space, and maybe share some useful tips with you. Even if what works for me might not exactly fit your situation, I hope you will get something out of it to try yourself. While we were moving with the military from Germany to the US, across some states and then over to Japan for a couple years, I tried to paint on rare occasions at wherever ‘home’ was. 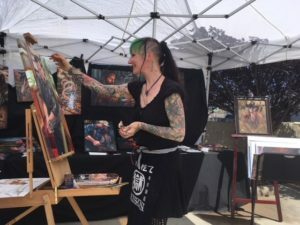 While my job as a tattoo artist travelled easily (and thankfully I was drawing every day at work), oil paints were not admitted in military luggage. So watercolors and acrylics seemed the way to go, which turned out to be quite fortunate. I had my tall easel with the current painting standing in a room corner – when I heard a thump and saw the tiny Japanese kitten, that had just recently joined our family from the streets of Tokyo, happily climbing up the front of the painted canvas (note to self: textured paint paste screams ‘free-climbing wall’ to adventurous cats). So what did I learn from this – and from countless pen-wrestling matches with our two rescued monsters? 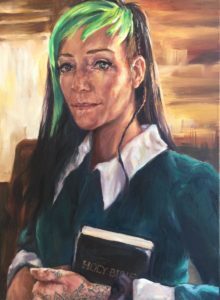 If I ever wanted to take up my love affair with oil paints again, or do lasting artwork without continuous interruptions by someone trying to catch my brush, I needed my own space with at least a door or two (two are better) between me and friendly interruptions. To include never-ending household chores and other useful errands threatening to eat up your creative time! Keeps you away from distractions and everyday tasks (because they never end). Signal clearly you are at work and shouldn’t be disturbed. I’m a lucky pumpkin, since here in our new permanent home in Prescott, I happen to have exactly that type of space. 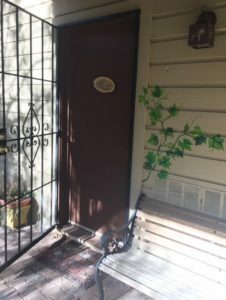 Our house came with a little ‘drawback’: a long room on the hillside lower level that had no connection to the rest of the home, and an extra entrance via a narrow path to the rocky ‘garden’. We smartly decided with the addition of a bathroom it would be the perfect separate guest room for visitors from overseas, coming to see the Grand Canyon. And put together a sweet little temporary home, with shower and guest bed, some country style antiques, mini fridge and all the fixings. Real darlin’! And as soon as the first guests left… that empty room seemed a great space to keep my easel in. And all my paints. And canvases. And an extra work table. And more art supplies. And a new easel. And a lot more bulk canvas. Oh, and all those paintings…. I first slowly, then rapidly exploded all over it (Sorry. Currently no guest space available in these parts!). Now, nothing makes me happier than running down to my devoted painting space, with three windows looking out to pines, hummingbirds and critters. I have everything I need to spend a full day immersed in art without interruptions: reference books and a few art magazines, paper towels, water, a water cooker for tea or ramen, dark chocolate and squirrel food. Not to forget plenty of podcasts and audio books to listen to during seven hours of painting! 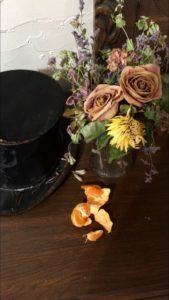 I’m the first to realize that not every home accommodates for such a lucky arrangement (I’m also pretty lucky to have an awesome and supportive husband who puts up not only with my bird and critters on the deck, but also with my at explosion downstairs). How often do you really use that extra guestroom/ laundry room/ office space? Here in Arizona some houses feature a ‘casita’, a one room guest house, which make great art retreats as well. Maybe a shed and a space heater will work (plant some trees for shade over it). A well lighted garage serves for some. Or maybe even a room divider for your own private corner can do the job (you can use the divider to hang some canvases, too!). Maybe you can rent a studio, or join a studio community. Ask a friend to share a space. At best, you want some door or division between you and mundane tasks or your favorite distractions, and some windows but no direct sunlight. But the important point is to find a designated space just for your art. Some place where all your work tools are just waiting for you to drop in and start playing. A little hideaway that makes you happy, and where you love going to. Find an old, comfy arm chair for breaks. 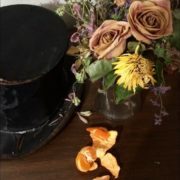 Arrange your favorite clutter aka still life inspirations. Have water or a beverage nearby so you don’t run away every few minutes. Be set up. It will also increase your self esteem. Maybe you see yourself as a stay at home Mom that occasionally gets the paints out. Well, now you got a studio space – which makes you an artist, right? ;) (remember perception is 90% of reality!). Seriously, taking the first step to show that you are committed to your gift will change the way you perceive your artistic exploits yourself. And that will encourage you to pursue your passion with the zeal that makes you happy. My little stolen studio is the biggest blessing for my art :) I will write about some items that make my work there better in my next post, and I hope you’ll be around to give me some feedback about your favorite tools! https://www.anstaylor.com/wp-content/uploads/2018/03/studio1b.jpg 1136 640 Ans Taylor /wp-content/uploads/2017/10/ans-taylor.jpg Ans Taylor2018-03-21 16:28:022019-04-16 20:50:59Studio tools for the emerging artist 1: Get your painting space!